Activists In Myanmar Say Facebook Needs To Do More To Quell Hate Speech "The risk of Facebook content sparking open violence is arguably nowhere higher right now than in Myanmar," six Myanmar organizations wrote in an open letter to Facebook CEO Mark Zuckerberg in April. 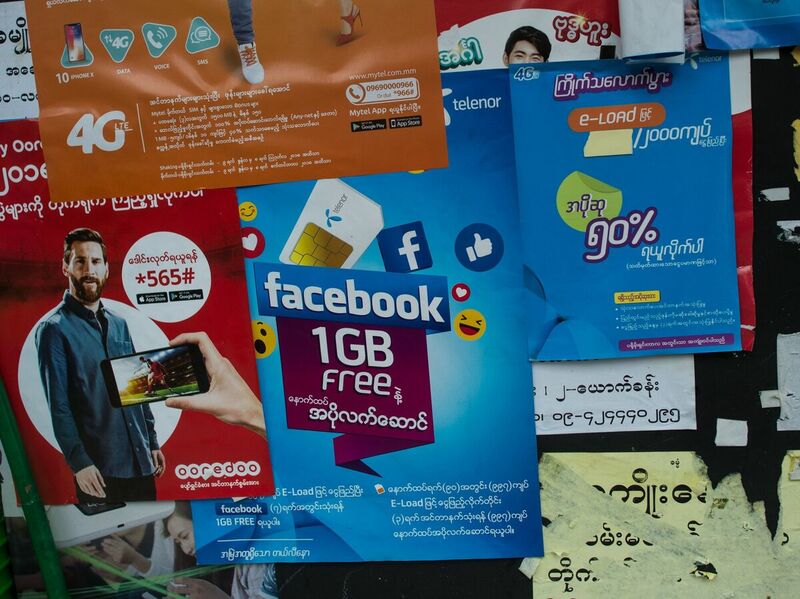 The Facebook logo is seen on an advertisement by a local telecom company in Yangon. "People think that Facebook is the Internet. It comes pre-installed on the phones that they buy," says a Yangon-based digital activist. There are an estimated 27 million Facebook accounts in Myanmar. That's the situation in Myanmar, where civil war has festered for decades and the end of military rule has unleashed virulent nationalism and intolerance toward minorities. U.N. investigators and human rights groups allege that Facebook has fanned the flames of a conflict that U.N. officials have said amount to ethnic cleansing and bear the hallmarks of genocide. Fighting between ethnic Rakhine Buddhists and Rakhine Muslims, insurgent attacks and military anti-insurgent operations have sent Rohingya Muslims fleeing into Bangladesh. More than 900,000 Rohingya refugees now live in Bangladeshi camps. U.N. agencies and aid groups have called it one of the world's most serious humanitarian crises. Hate speech reportedly spiked on Facebook after Rohingya insurgents launched coordinated attacks against Myanmar military and police bases in Rakhine State last August. Civil rights groups and digital rights activists in Myanmar are taking action and demanding that Facebook beef up its moderation of Burmese-language content to curb hate speech. They are also trying to educate Internet users about creating a safer, more civil space for online discussions. "The risk of Facebook content sparking open violence is arguably nowhere higher right now than in Myanmar," six Myanmar organizations wrote in an open letter to Facebook CEO Mark Zuckerberg in April. In the letter, they warned, "Our community continues to be exposed to virulent hate speech and vicious rumors, which Facebook is still not adequately addressing." 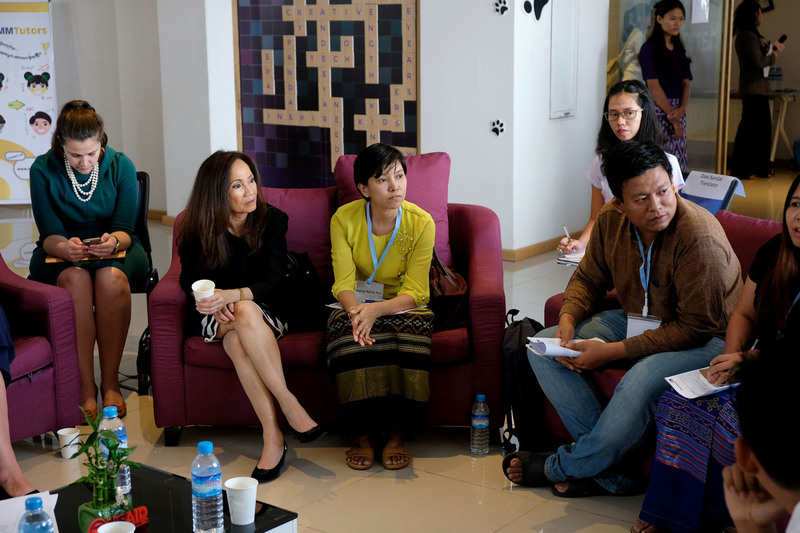 Myanmar activists meet with visiting U.S. officials at Phandeeyar, a Yangon-based tech hub and one of several groups that have pressed Facebook to moderate its Burmese-language content to prevent hate speech. Zuckerberg responded to the letter, saying Facebook was trying to do more to address the issues in Myanmar, including increasing "the number of people across the company on Myanmar-related issues" and employing a "special product team working to better understand the specific local challenges and build the right tools to help keep people there safe." But activists say it's not enough. "Unfortunately, we've seen very, very little by way of reaction or allocation of resources from Facebook to effectively mitigate and create solutions for these important problems," said Jes Petersen, the CEO of Phandeeyar, a Yangon-based tech hub and one of the groups that signed the letter. One factor is the explosive growth of Facebook and the Internet in Myanmar, one of Asia's poorest countries. Most of the country has gained access to the Internet only in the last decade, mostly through mobile phones. "People think that Facebook is the Internet. It comes pre-installed on the phones that they buy," says Yangon-based digital activist Thant Sin. He says that Myanmar, a nation of about 53 million people, has about 27 million Facebook accounts. (Some users have multiple accounts). "We're falling behind on digital literacy," he observes. Thant Sin says efforts to promote digital literacy in Myanmar include teaching people how to protect their personal information, how to control what information they see online and how to keep online discussions free of hate speech. At a Senate hearing in April, Facebook CEO Zuckerberg acknowledged Facebook's problems in Myanmar and promised to hire dozens of Burmese-language moderators. According to Facebook's job ads, some of these positions are apparently based in Dublin, where the company's international headquarters is located. Petersen notes that in Germany, where the government strictly regulates content to prevent hate speech, Facebook has around 1,200 moderators. "If they were to have the same user-to-moderator ratio for Myanmar," he argues, "they would need to have 700 people." And all would have to speak and read the local language, Burmese. Facebook also uses artificial intelligence to identify hate speech, but activists say it often doesn't work. Petersen says Phandeeyar is also pressing Facebook to be more transparent about its operations. "How much bad content are you removing? How many reports are you getting? How many accounts are you closing down?" he asks. "We're not necessarily asking them to disclose sensitive information. We'd just really like to see some numbers." Jes Petersen, CEO of Phandeeyar, a Yangon-based tech hub, speaks to visiting U.S. government officials and civil society activists. Phandeeyar is one of several groups that have pressed Facebook to moderate its Burmese-language content to prevent hate speech. Facebook said nobody was available to answer questions for this report. 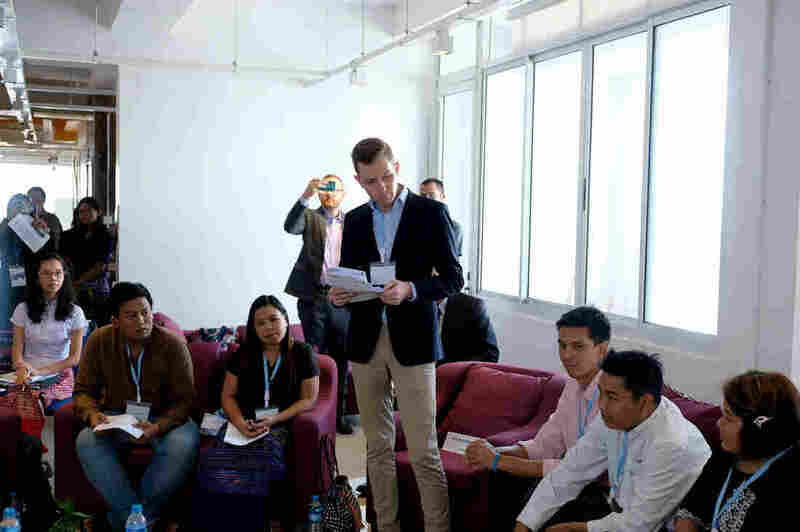 Speaking Monday at the New America Foundation, the organization's head of global policy management acknowledged that in Myanmar, "it is a complicated landscape, and there is a lot more we can do there." Zuckerberg has pledged to work with civic groups to identify those who disseminate hate speech, in order to shut down their accounts. Last week, Facebook blacklisted a group of Buddhist hardliners in Myanmar. But some monks vowed to keep using the platform to spread their messages, even if they're banned. "We will keep using Facebook with different names and accounts to tell the truth to people," one told Reuters. Earlier this year, Facebook confirmed it had closed the account of a prominent monk named U Wirathu, the leader of a Buddhist nationalist movement. He was jailed more than a decade ago for inciting riots against Muslims. He has since been released and has been accused of using Facebook posts to incite similar violence in recent years. Are Buddhist Monks Involved In Myanmar's Violence? Buddhist nationalists in countries including Myanmar, Thailand and Sri Lanka believe that Muslims intend to replace Buddhism, the majority religion in these countries, with Islam. This is what they believe happened many centuries ago in Afghanistan and Indonesia. Myanmar activists say Facebook should have taken action against U Wirathu and his numerous followers years ago. "Facebook is making zillions of dollars from [the] Myanmar community," says Hla Hla Win, an Internet entrepreneur. "They can do a lot better than that. Be more responsible about it." The activists caution that they're not trying to kick Facebook out of Myanmar. They just want it to solve its problems and realize its potential as a force for good.